Best pillows for side sleepers are pillows that actually support your head and neck. There are many pillow brands that claim to provide that needed support, but fail to deliver. If you are in fact a side sleeper and have tried pillows that are advertised as “side sleeper pillows” and have failed you, you are not alone. With so many so called “side sleeper pillows” on the market it could be a bit challenging finding one that works for you. It is critically important that your side sleeper pillow is the proper height and the material used is the right density to provide the needed support for your head and neck. To keep your spine in perfect alignment as you toss and turn throughout the night, OBS recommends you consider the SleepRight® Side Sleeping Pillow by Splintek® it is one of the best side sleeper pillows available. A word of caution, only buy from an authorized Splintek® retailer, that is reachable by phone to assist you with determining the correct pillow height that would work best for you and to also explain their exchange and 5-year replacement policy. 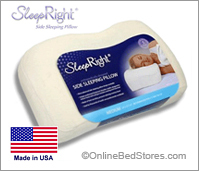 12 x 24 x 3″, 4″ or 5″ Side Sleeping Pillow, 5-Year Replacement Warranty.